Seems like Harry Styles and Susan Boyle have something in common, their hairstyles or lack there of if you ask me. 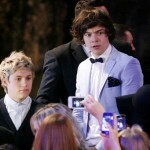 Harry has been catching flack lately because of his Boyle like hairdo. You might remember Susan Boyle who rose to fame from Britain’s Got Talent TV show with her unbelievable singing voice.